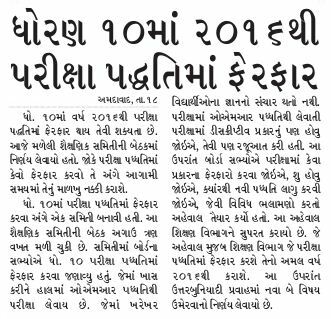 Standard 10 Ma Year 2016 thi Examination Methods Ma Ferfar Thay Tevi Shakyta Chhe. Gai Kale Maleli Educational Samiti Ni Bethak Ma Nirnay Levayo Hato. Joke Exam Method Ma Kevo Ane Kayo Ferfar Karvo Te Ange Aagami Samayma Neni Method Nakki Karvama Aavshe.